Greek galley of the Homeric era. In a recent post about competing concepts for the reconstruction of Greek galleys of the Homeric era, I suggested that the one championed by Bjorn Landstrom seemed unlikely due to its apparent lack of seaworthiness. My assumption was that the boat – a long, sleek monohull dugout equipped with rowing outriggers, but no outrigger floats – had too little stability and too little freeboard to venture outside of well-protected waters. To counter this argument, reader Edwin Deady, who maintains the website Dark Age Boats, called my attention to the Monoxylon II experiment, which amply demonstrated the seagoing capabilities of an open monohull dugout of an even more ancient design. 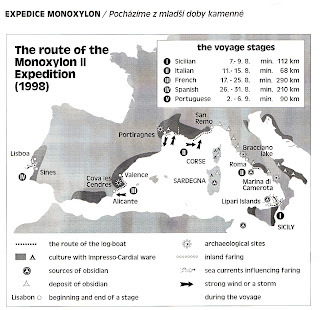 Conducted in 1998, the Monoxylon II Expedition sought to determine whether dugouts could have been the vehicle for cultural transmission in southern Europe around 7,000 BC. This was the time at which the Mesolithic began to give way to the Neolithic in Europe, as evidenced by the spread of agriculture, animal husbandry, new pottery styles and other technological advances. There's ample evidence that the beginnings of the new technical complex in Europe were imported from western Asia, not homegrown. And since its initial appearance in Europe was not only along the mainland shores of the Aegean and Mediterranean seas, but also on numerous islands, it must have been transmitted, at least in part, by boat. Evidence about the nature of those boats appeared in 1994 with the discovery of a large, well-preserved oak dugout in Lake Bracciano, on Italy's west coast. Although discovered in a lake, the boat's size (35 feet LOA; beam of 3.5 feet at the stern and 2.5 feet forward) appear excessive for lake use. It is thought that higher sea levels at the time to which the boat has been radiocarbon dated (5450 BC) would have caused the lake to be connected to the sea by a river, so there is good reason to believe it was a seacraft. The canoe had four braces, created by leaving original material standing proud on the interior surface, in the manner of ribs. The recovered hull's thickness varied from 2 to 4 cm., but it is thought that the wood may have compressed over the millennia, and that the original thickness may have been about 5 cm. The possibility of the use of sail is suggested by the presence of a rectangular notch in the bottom (a possible mast step?) and some fragments of textile, but the evidence is far from conclusive. Paddles were more likely the primary means of propulsion. 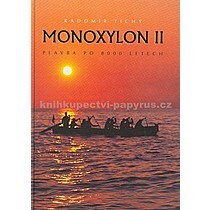 Monoxylon II, with a crew of eleven. In 1988, Czech archaeologist Radomir Tichy led a team that recreated the Lake Bracciano dugout quite faithfully. The finished replica was some 1.25 meters shorter than the original, not by plan, but because rot was discovered in the trunk partway through construction. This truncation also resulted in the elimination of one of the four "ribs" in the replica. Because the upper edges of the Lake Bracciano boat had been lost and its full height is therefore unknown, the replica's depth, at 90 cm, was a guess. A substantial amount of construction was done with Neolithic-style stone tools to prove the concept, after which iron tools were substituted for efficiency. 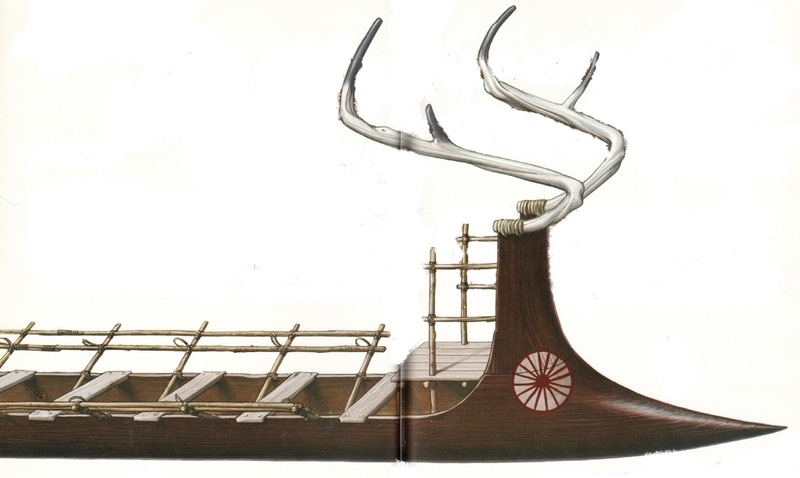 The experimenters estimated that to build the entire boat using only Neolithic tools would require only 300 man-hours. 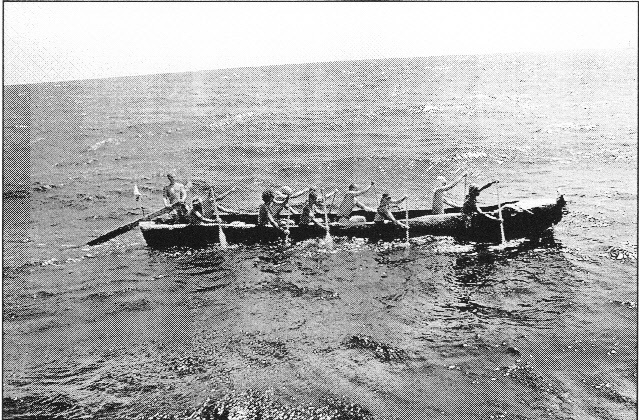 That same year, the team campaigned the canoe in various locations around the northern shores of the Mediterranean. Various crews of 8 to 10 paddlers plus a helmsman on a steering oar put about 500 miles under the boat's keel in a variety of conditions. With the boat's center of gravity below the waterline, the crew found stability to be very good, even in 2-meter waves (although bailing was necessary in those conditions). The boat was not noticeably affected by current, but headwinds greatly impeded progress. (They paddled in conditions up to 7-9 Beaufort.) Average speed under all conditions was 4 km/hr. Cargo of more than 100 kg. of obsidian (an early trade good), plus water and bagged wheat did not overload the boat. With a total load of nearly a ton (cargo plus crew), the paddlers felt that much heavier loads would have been both feasible and safe. Tichy concluded that the dugout was indeed a viable vehicle by which the "Neolithicization" of Europe might have occurred. Some islands in the Mediterranean would have required more than a single day's paddling to reach, but none, apparently, were out of the practical range of a well-built monohull dugout, and "it would be possible to travel the whole coast of the Western Mediterranean up to Sicily in at most several months of persistent going," Tichy wrote. According to Tichy, "A place probably without preneolithic occupation could be colonised by a group of 40 people with the necessary minimum amount of domesticated animals and crops a total of 15-18 ton load (sic). The load would be carried with 10 to 15 boats, each of them would take one to two tons." I believe Tichy is here referring to colonization of a carefully planned nature – a conscious intent to establish a permanent community en masse. I think the process could also have occurred on a much smaller scale, with possibly as few as one or two boats containing one or two families and a couple of goats striking out to set up a farmstead on unoccupied land across a strait or down the coast. Afterword: Once I got going on this post, I realized that monohull dugouts have proven themselves as seagoing vessels in more modern times than the Neolithic, or even the Greek Bronze Age. The Native Americans of the Pacific Northwest famously conducted whaling, warfare, and trade in their huge cedar canoes from Alaska to California well into the 19th century, and from 1901 to 1904, Capt. 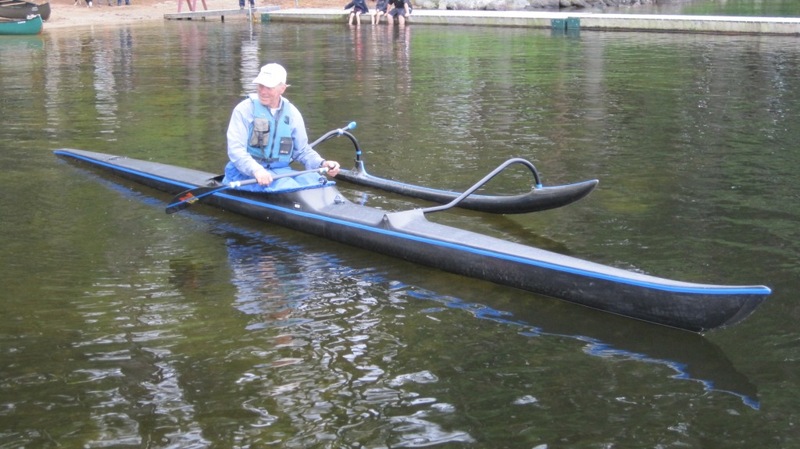 John Voss took his modified Nootka dugout Tilikum two-thirds of the way around the world. The Maoris also built enormous monohull dugouts into the historic era, and it is thought that these may have been the vehicle by which New Zealand was colonized from Polynesia prior to 1100 AD. Acknowledgments: Much of this post derives from the English-translation appendix to Monoxylon II by Radomir Tichy (Dobrodruzstvi Experimentalni Archaeologie, 1999). Also consulted was this article in Discover. Many thanks to Edwin Deady for his inspiration and assistance on this post. 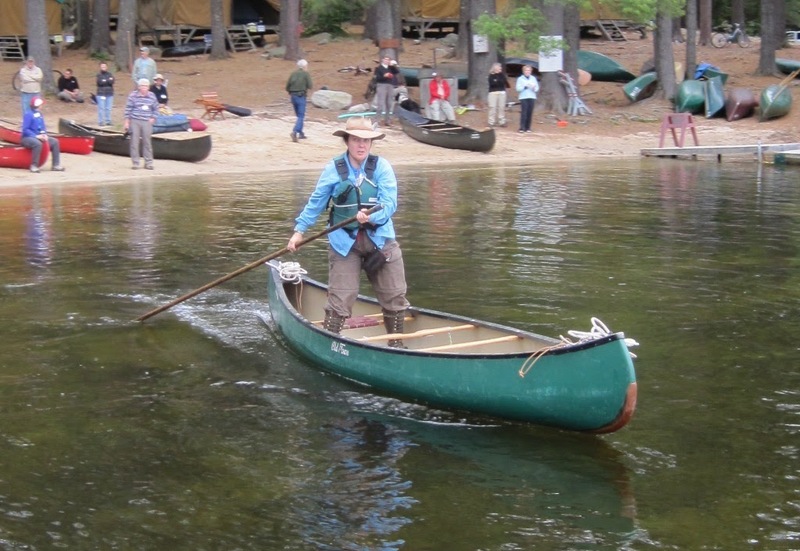 This weekend I attended the Maine Canoe Symposium, as I've done every June for the past five or six years. 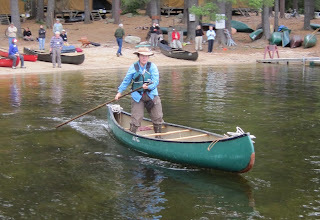 Held on Moose Pond in Bridgton, Maine, it is one of the highlights of my year -- a great weekend of paddling workshops, fine people, and abundant good food. If you're in the area at the right time of year, I recommend it highly. 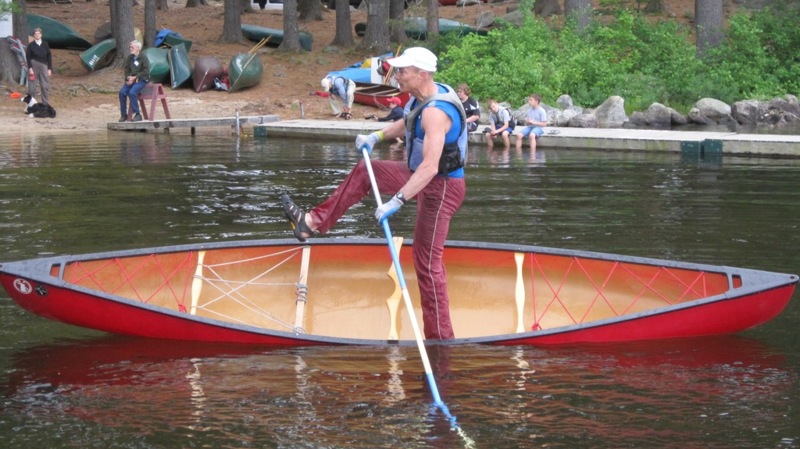 One presentation each year is the so-called Paddling Styles Demonstration. 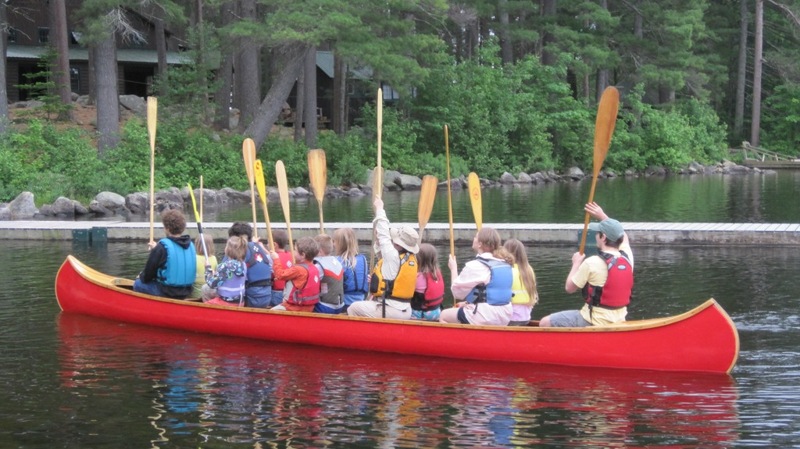 Although it's by no means exhaustive in presenting all the ways that canoes can be propelled, it does cover the variety of canoeing styles that are taught at the workshop. Here they are. Caleb Davis demonstrates the Classic Canadian Solo paddling style, also known (oddly) as "Omering" for its popularizer, Omer Stringer. 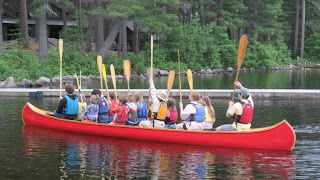 Not really a demonstration of a paddling style, the kids at the symposium raise a salute while paddling a "war canoe" to remind us that they represent the future of the sport. 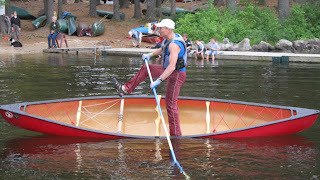 Geoff Burke demonstrates "double-paddle" canoeing, a.k.a., double-bladed paddling, in a Rushton-style lapstrake canoe that he built. Lisa DeHart gives a demonstration of poling, touring-style. 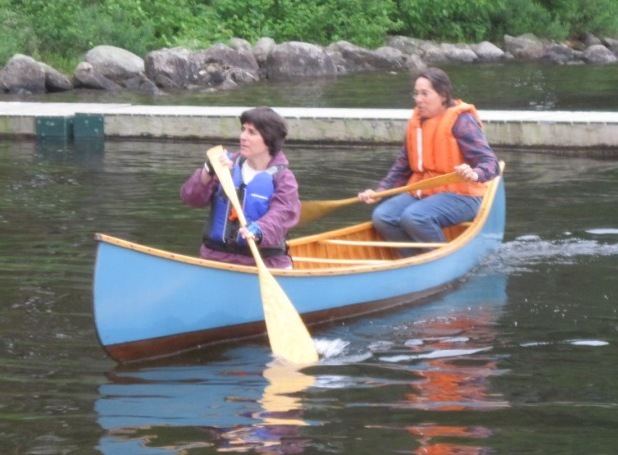 Lynne Lewis (bow) and Jane Barron show the Northwoods stroke, a paddling style developed in Maine that allows the paddler to keep going all day with minimal effort. River touring skills were demo'd by Kevin Slater (bow) and Kevin Silliker. Kim Gass shows off her technique in a Freestyle demonstration. I borrowed her lovely little boat later and managed to dump it in flatwater. 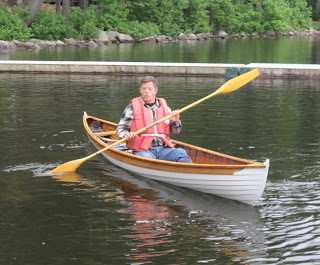 Benson Gray reminds us that it's not all paddling that can make a canoe go. 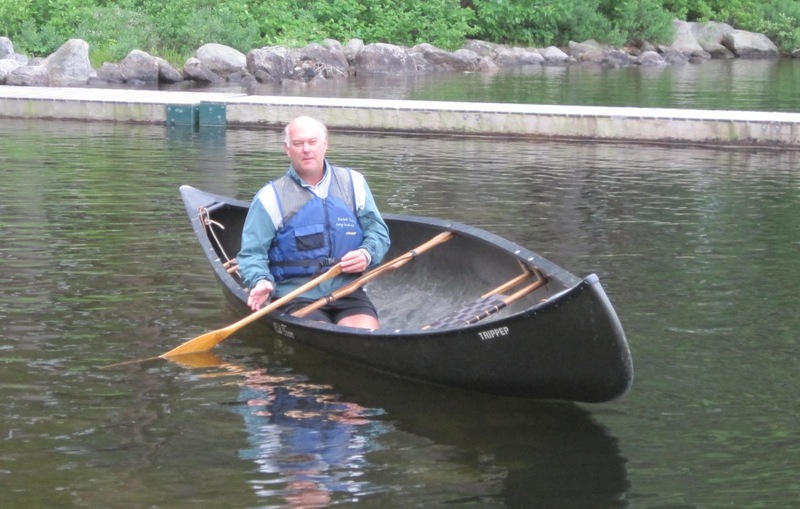 He restored that beautiful old Old Town sponson canoe. 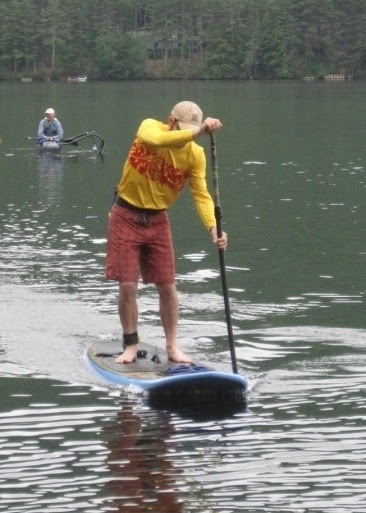 For the first time, Stand-Up Paddling was included at the symposium, demo'd here by Mark Hamlin. While it's certainly related to canoeing, I question the inclusion of SUP in the symposium. 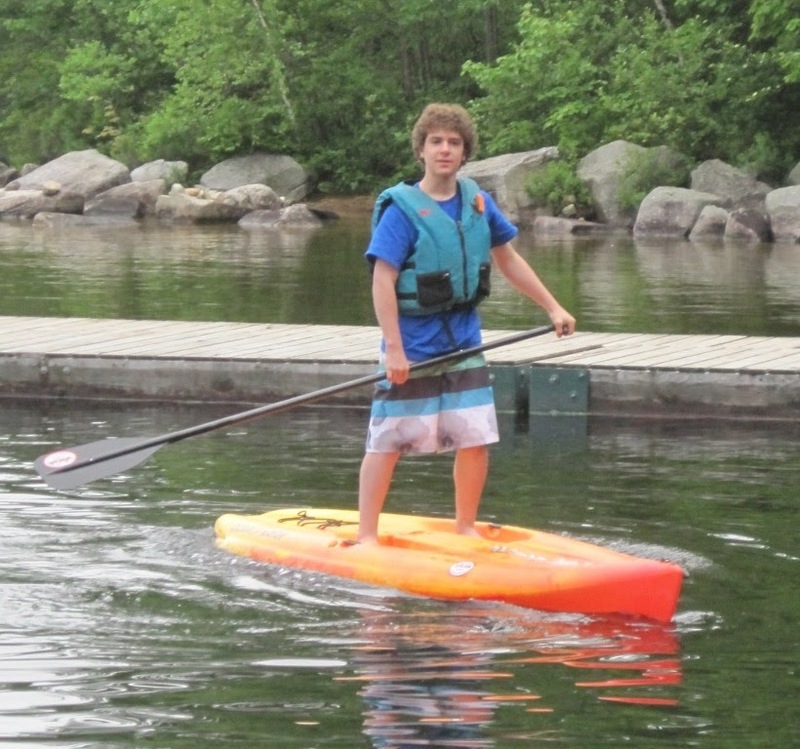 Just because I want to, here's my son Max trying out a SUP board for the first time. Rotten kid stole my PDF! 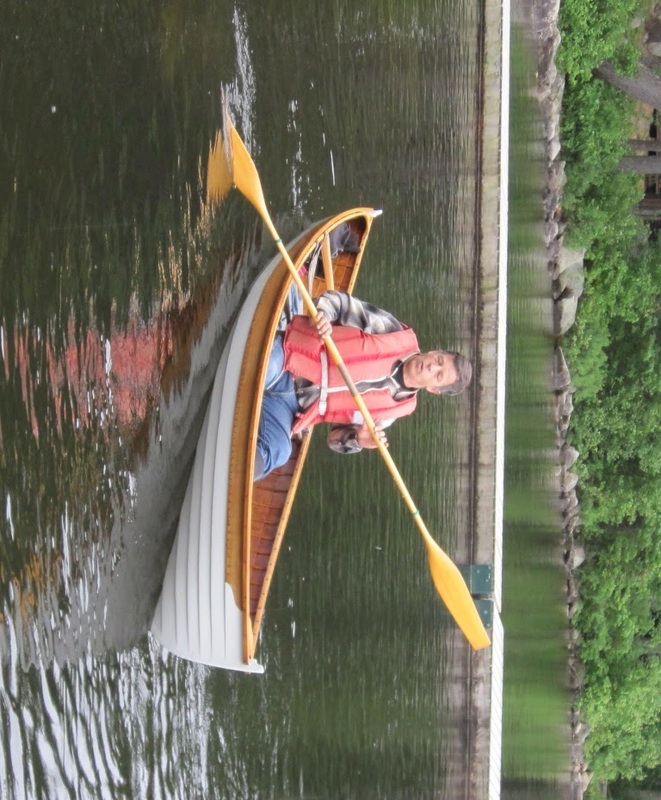 Reinhard Zollitsch taught a workshop on paddling a solo outrigger canoe. My wife, who is a timid and not very accomplished paddler, found the outrigger very confidence-inspiring. 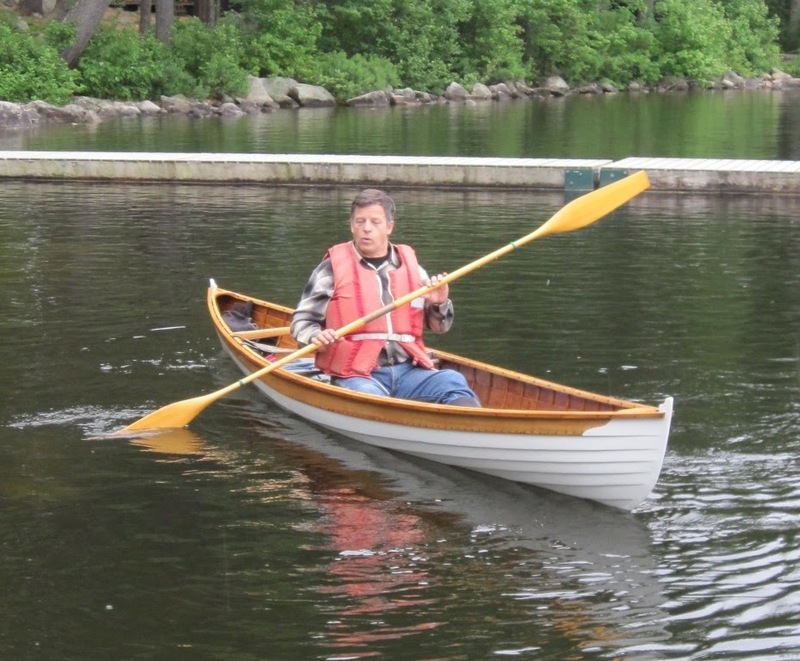 Jim and Lisa Lisius demonstrate "sit and switch" paddling, a.k.a., American Touring Style. 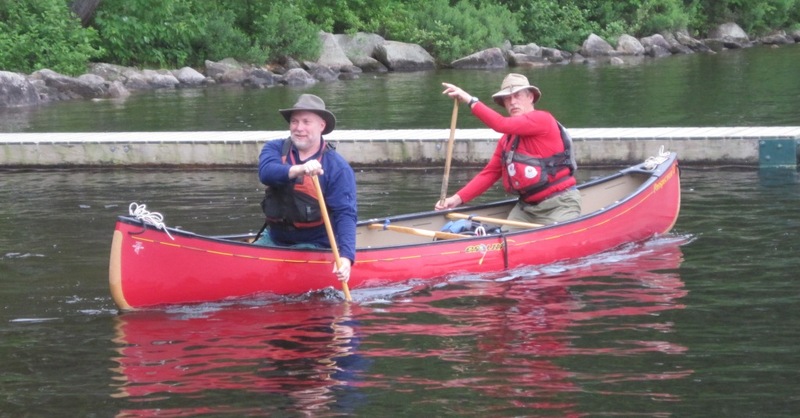 They're doing it in the same canoe in which they paddled entirely across the continental U.S.
Harry Rock showed us how to do Recreational Poling. 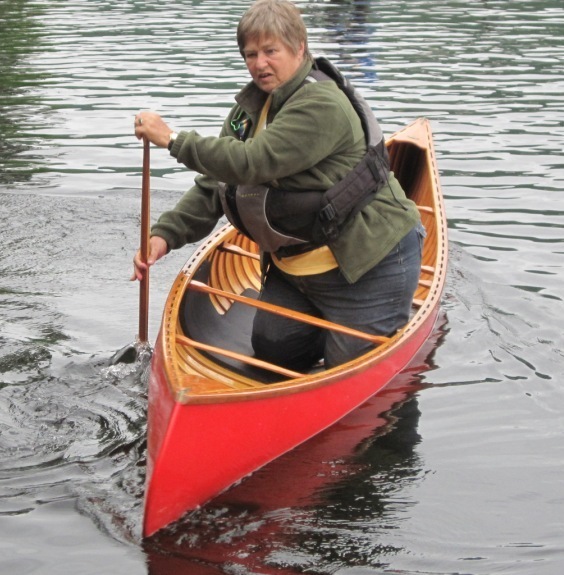 It differs from Lisa DeHart's style in that it's somewhat sportier and not specifically oriented toward touring with a laden canoe. 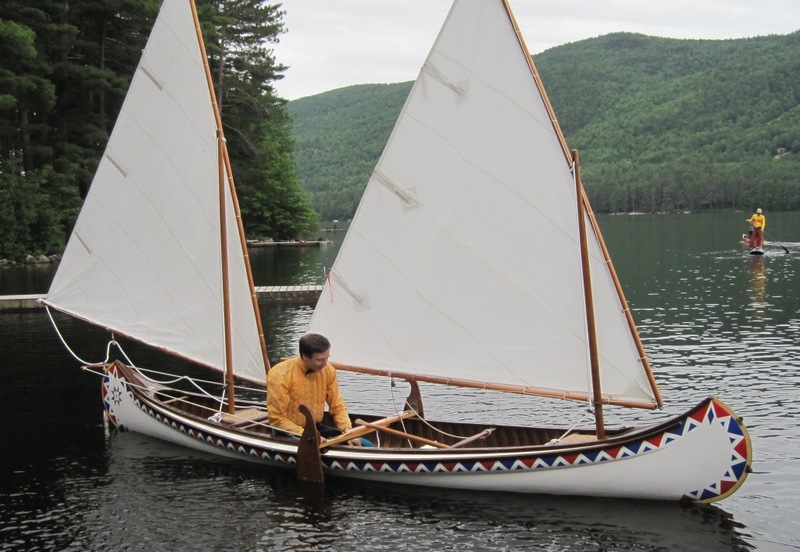 "May I pose a question about the reproduction and use of indigenous boats? 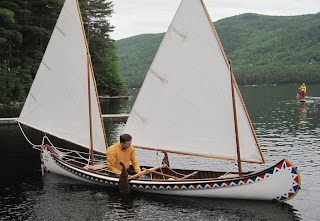 Some builders seem reluctant to share plans other than with the indigenous group for whom they are build, see http://www.applegateboatworks.com/coastal.html for example. Now I am not criticising their particular stance and had a very friendly and helpful email on construction details from them but I do wonder what point is served by exclusivity. The same is seen in the singing of some traditional songs where I have even heard a performer say that they had sought permission from a Council of Elders before singing to a non-ethnic audience. If all of my culture is available to the World, you play football everywhere and paddle coracles where you will, why should not the same apply to indigenous boats from other countries?" I can understand why a group of reenactors or serious academics might want to hide technical aspects of work in progress: so that they can claim credit for new insights and/or gain the glory of a "first." But I agree with Edwin that, once they've introduced their glorious reproduction, there seems to be little reason to hold the information as proprietary. I also question why people of any given culture should attempt to restrict access to elements of their culture's artistic expressions: it seems like the fruits of a parochial worldview, to say that this or that culturally distinctive activity is what separates us (i.e., makes us better than) everyone else.